Honor the Earth’s map showing Enbridge Line 3’s current and proposed routes through northern Minnesota. 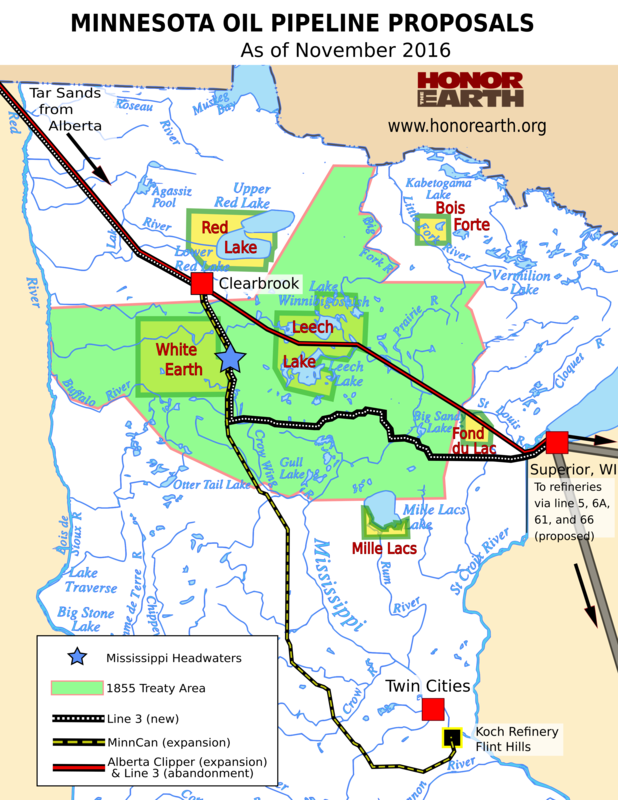 The green area represents where the Ojibwe have treaty rights to hunt, fish and gather wild rice. The public comment period is now open for a proposed crude oil pipeline running 337 miles through northern Minnesota, threatening our lakes and rivers and Ojibwe livelihood and lifeways. The pipeline would carry tar sands crude, a particularly dirty form of fossil fuel, for Alberta, Canada to Superior Wisconsin. This is Minnesota’s version of the Dakota Access Pipeline. The Minnesota Department of Commerce released a draft Environmental Impact Statement (dEIS) on May 15, and the public comment period runs through July 10. What are Tar Sands? provides background on Canadian tar sands extraction and the many ways it is harmful to the environment. Line 3 and the Pipeline System explains Enbridge’s plan to abandon its current Line 3 in place and install a new and larger pipeline. It’s proposed new route – crossing the Mississippi headwaters area and prime wild rice area – threatens the state’s clean waters. Line 3 and Energy Security explains why Line 3 is not about our country’s energy security, but about corporate profits. Line 3 and Treaty Rights explains how Enbridge’s proposal threatens the Treaty of 1855, which gives the Anishinaabe (Ojibwe) people the right to hunt, fish and gather wild rice in a large area of northern Minnesota, including off-reservation lands. For the deep dive, here is the draft Environmental Impact Statement issued by the Minnesota Department of Commerce. Here is a previous blog commenting on the Environmental Justice chapter: “Environmental Justice” Analysis of Proposed Crude Oil Pipeline is Flawed, Lacks Native Voices. The Minnesota Department of Commerce issued the dEIS and it will host nearly two dozen public meetings to take comments.These meetings are critical as the Department will rewrite the dEIS based on public feedback. That becomes the final Environmental Impact Statement. That document will influence the Minnesota Public Utilities Commission on approving (or not approving) the pipeline. The dEIS is long, but to make effective comments it’s best to cite chapter and verse of where this document has shortcomings. Various environmental groups are analyzing the document and will be providing helpful commentary and suggested critiques. Stay tuned for more information. All but one meeting will be held in northern Minnesota near communities that would be affected by the pipeline. The one Twin Cities hearing will be Tuesday, June 13, 6-9 p.m. at Intercontinental Hotel Saint Paul, 11 E. Kellogg Boulevard. Get that one on your calendar! For a full list of public hearings, here is the link to the Department of Commerce’s website. It also offers more background information. The best comments point to specific sections or page numbers of the DEIS and explain precisely how and why they are inaccurate, incomplete, biased, based on unfair assumptions, etc. It is also good to reference credible sources of information that you think the State should take into account. Feel free to include personal stories or accounts of how the project will directly affect you, your rights, your community, the resources you depend on, etc. Comments such as “Please build the pipeline because I need a job” or “Water is Life, No Pipelines!” do not have much impact…but may be counted in an overall tally, so something is better than nothing! MN350 also has a webpage on Pipeline Resistance, with additional information on Enbridge.